Each $5 ticket gets you 3 sets of seven numbers from 1 — 49. You may choose your first set of 7 numbers or ask for a Quick Pick to have all 3 sets randomly chosen for you. You can play up to 5 plays (15 selections) per ticket. The main Lotto Max draw has jackpots of $10 to $60 million. When the jackpot reaches $50 million, additional $1 Million prizes, called MAXMILLIONS, are added. The top prize for the Extra game is $500,000. Each set of seven numbers could win or share the jackpot and any MAXMILLIONS for that draw. Main prize: Every draw, seven numbers are drawn from 1 to 49, plus a Bonus number, used for several prize categories. To win or share the Lotto Max jackpot, you need to match all seven of your main Lotto Max numbers to the seven numbers drawn. MAXMILLIONS: When MAXMILLIONS prizes are added, additional set(s) of seven numbers from 1 to 49 will be drawn for each MAXMILLION prize. To win or share a MAXMILLIONS prize, you need to match all seven of your Lotto Max numbers to a set of seven MAXMILLION numbers drawn. Extra: If you said "YES" to the Extra and all four of your Extra numbers (between 1 to 99) match the four Extra numbers drawn, you win the top prize. More on prizes and odds of winning. If you’d like to purchase tickets for more than one draw, play Advance Buy. Choose how many consecutive draws you want to play (up to a maximum of 26 draws) and pre-pay at a retail location. Or if you buy your tickets on PlayNow.com, you can set up a lottery subscription to automatically purchase your tickets for you on a pay-as-you-go basis. Whether you play with family, friends or co-workers, playing as a group lets you pool your money together for more chances to win! 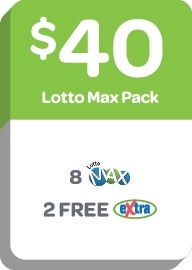 Packages are a great way to buy multiple Lotto Max plays or to play different combinations of Lotto Max, Lotto 6/49, BC/49, Daily Grand and the Extra in one quick, easy transaction. Select packages are available for purchase at retail locations and PlayNow.com. 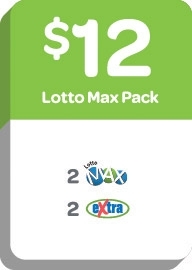 A Quick Pick pack consisting of two plays (6 selections) of LOTTO MAX, plus 2 plays of Extra. Advance Buy is available, up to a maximum of 26 consecutive draws. Additional Extras are available at a cost of $1 per play, up to a maximum of 8 per ticket. A Quick Pick pack consisting of 4 plays (12 selections) of Lotto Max. Advance Buy up to a maximum of 26 consecutive draws is available for purchase at retail locations. 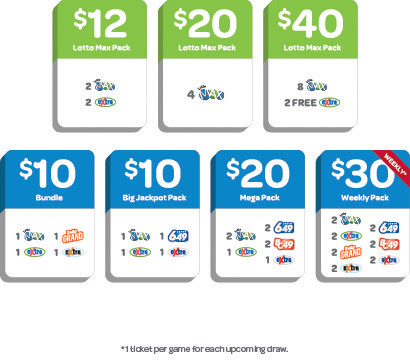 You can add the Extra at a cost of $1 per play, up to a maximum of 10 per ticket. A Quick Pick pack consisting of 8 plays (24 selections) of Lotto Max, plus two FREE plays of Lotto Max Extra. 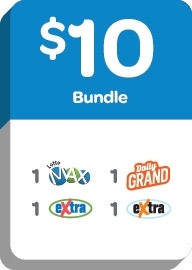 The $10 Bundle consists of one Lotto Max and Lotto Max Extra, one Daily Grand and Daily Grand Extra. Additional Extras are not available on the $10 Bundle. The $10 Big Jackpot Pack consists of one Lotto 6/49 ,one Lotto 6/49 Extra; and one Lotto Max, plus one play of Lotto Max Extra. Additional Extras are not available on the $10 Big Jackpot Pack. 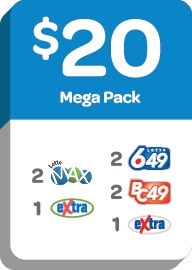 The $20 Mega Pack is a Quick Pick package consisting of two plays (6 selections) of LOTTO MAX, plus one play of LOTTO MAX Extra; two plays of Lotto 6/49, plus one play of Lotto 6/49 Extra and two plays of BC/49. Additional Extras are not available on the $20 Mega Pack. 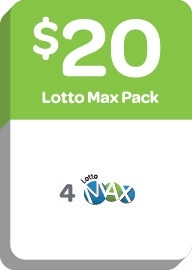 Combo Play is the easy way to play multiple selections for Lotto Max. You can choose either an 8 or 9 number Combo. The cost of Combo 8 is $40. Combo 9 costs $180. With Combo Play, you can choose your own numbers or ask for a Quick Pick to have random numbers chosen for you. Be sure to say “Yes” to the Extra for a chance to win $500,000. You can play up to 10 Extra on your Combo Play ticket. When you choose a Combo 8 or 9, the selected numbers are mixed together into every possible selection of seven numbers. Here's an example of the 24 selections created when you have the numbers 1, 2, 3, 4, 5, 6, 7 and 8 as the first selection, the numbers 11, 12, 13, 14, 15, 16, 17 and 18 as the second selection, and the numbers 21, 22, 23, 24, 25, 26, 27 and 28 as the third selection on a Combo 8. Combo 9 is created in the same way, except you pick nine numbers. Although Combo Play tickets only show the numbers you selected, all possible seven number selections are stored in the computer system's memory. Know how the game works and what the odds are before playing. The more you know about the games, the better equipped you are to make informed decisions when you play. Learn more about the odds at GameSense.com.